NETWORK FINALS: After NCAA TOURNAMENT adjustment, 60 MINUTES reduced to 1.6, NCIS: LA lost 0.1 and MADAM SECRETARY dropped 0.2. Elsewhere, SHARK TANK gained 0.1 in final numbers. CABLE HIGHLIGHTS: AMC’s THE WALKING DEAD led Sunday cable once again, but it dropped 0.18 to a new low 1.48, with the Sunday premiere of INTO THE BADLANDS at 0.42–way down from the 1.42 for its previous premiere, but that was also following a massive 4.72 for THE WALKING DEAD; TALKING DEAD (airing at 11:27PM) dropped 0.17 to 0.33. Adult Swim’s HOT STREETS was at 0.32/0.27 compared to last week’s 0.34/0.31. On Showtime, BILLIONS slipped 0.02 to 0.16 from last week’s season premiere, with BLACK MONDAY steady at 0.08, SMILF ticked off the chart to 0.05/175K, and the premiere of ACTION at 0.03/117K. HBO’s THE CASE AGAINST ADNAN SYED ticked up to 0.16. 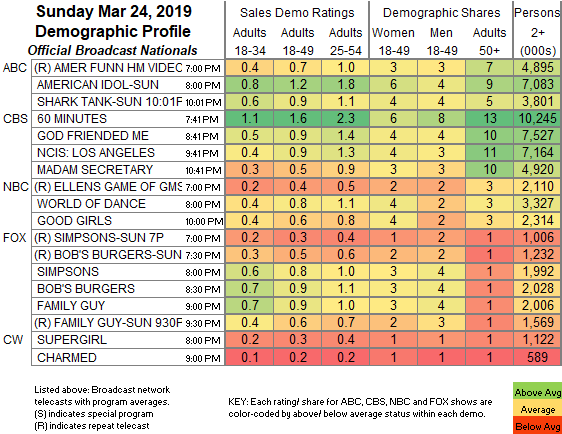 Starz’s just-renewed AMERICAN GODS ticked down to 0.10, and NOW APOCALYPSE was off the chart at 0.02/91K. The unscripted world was of course led by NCAA TOURNAMENT telecasts, with 8 of the day’s Top 10, led by TNT’s late primetime Ohio State vs. Houston game at 1.14. Bravo’s REAL HOUSEWIVES OF ATLANTA slipped 0.02 to 0.75, with MARRIED TO MEDICINE down 0.04 to 0.30. On Food Network, BUDDY VS DUFF dropped 0.06 to 0.43. On Discovery, NAKED & AFRAID was at 0.42 compared to last week’s 0.47/0.45, with ALASKAN BUSH PEOPLE up 0.02 to 0.41. Fox Sports 1’s NASCAR race was at 0.36. 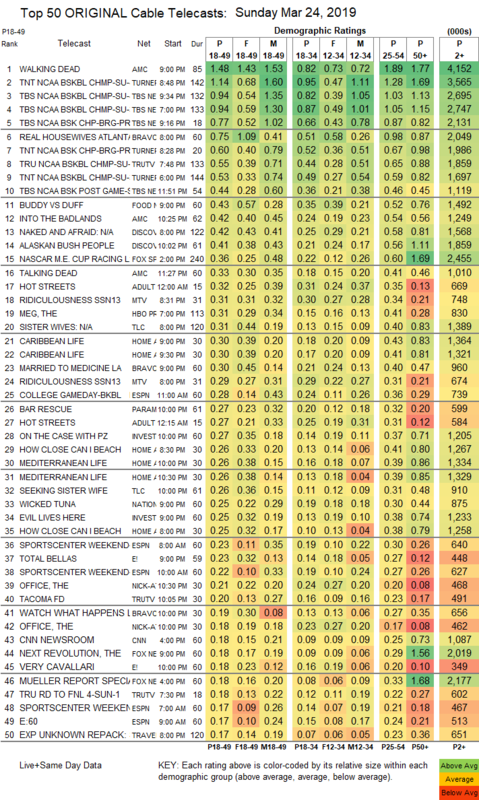 On MTV, RIDICULOUSNESS was at 0.31/0.29, compared to last week’s 0.36/0.33. On TLC, SISTER WIVES fell 0.06 to 0.31, and SEEKING SISTER WIFE was down 0.06 to 0.26. HGTV’s primetime was led by CARIBBEAN LIFE at 0.30/0.30, compared to last week’s 0.33/0.32. Paramount’s BAR RESCUE shed 0.04 to 0.27. On ID, ON THE CASE ticked up to 0.27, and EVIL LIVES HERE was at 0.25. On E!, TOTAL BELLAS rose 0.04 to 0.23, and VERY CAVALLARI was down 0.03 to 0.18.